Every June, the Internet Retailer Conference + Exhibition opens their doors to welcome merchants and suppliers from across the world. Well-known for being one of the preeminent ecommerce conferences for North America, IRCE has evolved over the years to become not only the final big event before summer, but has also become the networking event of the year. But if you’ve never been to IRCE before, it can be an overwhelming experience. With 130+ conference sessions, over 200 speakers, 600+ exhibitors, over 3100 unique companies, and a whopping 10,000+ attendees, where do you start? Keep reading for VL’s list of what to do (and how to do it) at IRCE 2018! IRCE is a beast of a show. If you’re attending 2018’s show without a plan, you really might want to reconsider! Every year, IRCE opening its workshop and seminar doors on the first day of the conference; this year, doors officially open for the always well-attended education sessions on Tuesday, June 5th, and full kickoff for the conference and exhibition floor is Wednesday, June 6th. This year’s IRCE will be our fourth time exhibiting for VL OMNI — and as much as we’re becoming old pros at getting the most out of IRCE as an exhibitor and an attendee, every year IRCE brings new elements in that make it the world-class conference it is, so even we find it useful to still do a deep dive on the show before we walk through the doors. So, whether you’re a first-time attendee or an IRCE veteran, there are some things you can do before the show to make the most of your time there. All it takes is a little bit of preparation! Coming to IRCE without at least a short list of exhibitors you’d like to speak to is a mistake IRCE attendees (and exhibitors, too) generally make only once. With the show starting next week, if you haven’t started perusing the list of 600+ exhibitors, there’s still plenty time to prepare. There are over 600 booths you could potentially explore at IRCE, but with only 2 days to explore the floor, attendees should definitely make full use of the exhibitor portal. Marking which exhibitors are a priority for you to visit and which ones you’d like to visit is an important exercise: VL OMNI highly recommends visiting all your priority booths on day 1, because come day 2, we guarantee you’ll be exhausted from day 1! Another great piece of advice is to leave room for the unexpected. 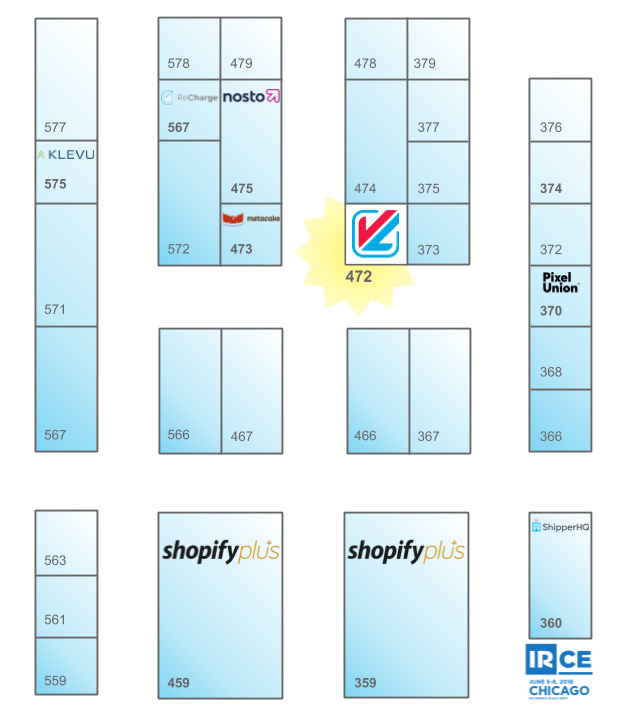 After all, one of the beauties of IRCE is that you have so many exhibitors and solution providers in a single place. You never know what you might stumble upon — it might just revolutionize how you do business! If you’re looking for a great starting place on what exhibitors to visit, VL OMNI has got you covered. Since we only surround ourselves with great partners that fit with our own philosophies, starting with some of these amazing companies if you’re not sure where to start is a great way to kick off IRCE. And we’re also in the Shopify Plus Partner area! — another great place to start if you’re not sure what to do first! Growing Omni-channel retailer or Etailer looking for agile, responsive, scalable solutions at IRCE? Grab a paper copy of the IRCE guide as soon as you can. This is your bible at the show! As much as you may think that you won’t need one, you’ll likely end up grabbing one at some point. Filled with everything you need to know about IRCE and a lot more reliable than the wifi and hotspots, there’s good reason as to why IRCE continues to print the guides! Download the IRCE App — and use it! The IRCE app is extremely useful for scheduling meetings, earmarking exhibitors and talks you’d like to visit, and connecting with other attendees. Download it ahead of time and spend a bit of time setting it up and playing with the features to save you time at the show. Earmark places where you can sit, eat, and drink. Those of us who attend a lot of conferences and trade shows know that a place to sit and take a bit of a breather is a must. IRCE has plenty of places to sit, network, and to grab a bite to eat and something to drink. And if you can’t find a seat? Come visit VL OMNI in booth 472; we’ve filled our space with comfy chairs for a reason! Find the booths giving away free necessities, instead of overpaying for them. The exhibitors at the show are here to help you, and in more ways than showing off great solutions and services. Many booths will be giving away staples like coffee, water, and small snacks. So don’t buy that coffee from Starbucks outside the event space until you have a quick walk around to find these lifesaver booths! Have fun and enjoy yourself. IRCE overall is always a great time, but it can be easy to forget to enjoy yourself in between networking and speaking sessions. Take your time, grab some great swag, talk to exhibitors, and save room for the after parties! You never know what you might find when you’re least expecting it!